We are dealing in Sizzler and Brownie Plates. These are made from high quality wood and cast iron plates which are widely used in Hotels and houses throughout the globe. These days the way of food serving, specially snacks presentation on sizzlers has become very popular. From Snacks Dishes like Tikka & Kebabs to serving hot deserts, like Brownie cakes, sizzlers have extensively been used to render that sizzling effect. We offer an array of Sizzler in Round Shape with & without handles. 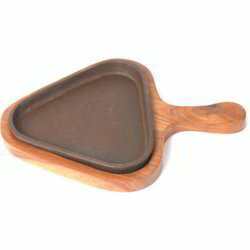 The Sizzler base is made of seasoned Sesham Wood & has a cast Iron Plate on Top. The Sizzlers are offered in 6", 7" & 8 "sizes. These days the way of food serving, specially snacks presentation on sizzlers has become very popular. From Snacks Dishes like Tikka & Kebabs to serving hot deserts, like Brownie cakes, sizzlers have extensively been used to render that sizzling effect. We offer an array of Sizzler in Round Shape with & without handles. 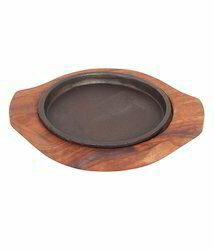 The Sizzler base is made of seasoned Sesham Wood & has a cast Iron Plate on Top. 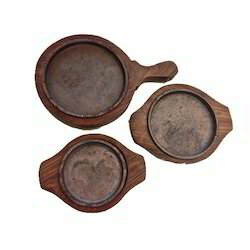 The Sizzlers are offered in various sizes. Our organization has attained expertise in the manufacturing, trading and exporting of Cast Iron Triangle Sizzler Plate. These plates are preferably suited for variability of purposes such as serving and house hold use. These offered plates have quality built and perfect finishing. Along with this, these plates are quite simple to use and clean. 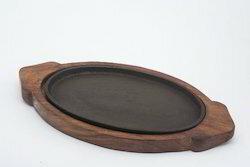 Looking for Sizzler & Brownie Plates ?